The Jeep Wrangler, an indirect progression from the World War II Willys MB, is an outstanding icon of the civilian vehicles. There are many different off-road vehicles that can run in the wild. Some of them are reliable, some of them are powerful, some of them offer excellent driving experience, and some of them are used by the military in the battlefields. But there isn’t another vehicle that could replace the Jeep Wrangler. No matter where it is, it can always easily be noticed even by people who are not quite familiar vehicles. In 2003, Jeep introduced the more powerful Jeep Wrangler Rubicon. This vehicle featured various additional equipment which enhanced its cross-country capabilities. In 2013, Jeep revealed the Wrangler Rubicon 10th Anniversary Edition. Its exclusive exterior color and unique black wheel rims made it different. This vehicle had the typical round headlights and 7 slot front grille, which gave it a distinctive look. 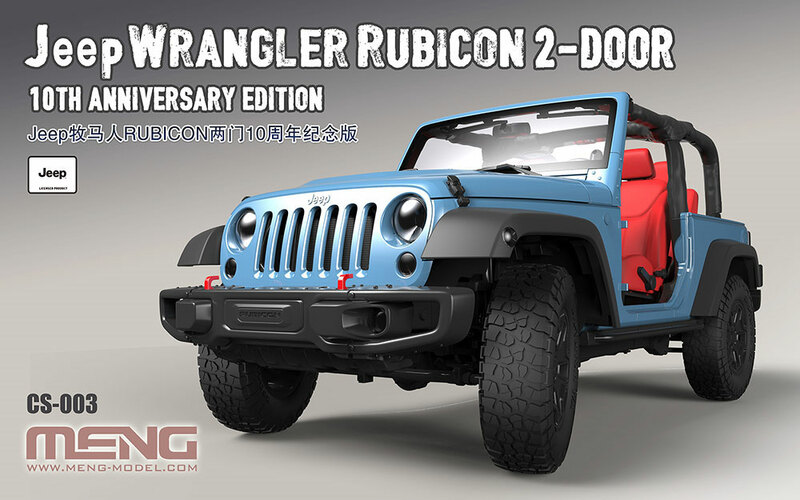 Now we have MENG’s third 1/24 civilian vehicle product, the CS-003 Jeep Wrangler Rubicon 2-Door 10th Anniversary Edition, licensed by the FCA US LLC. This kit accurately replicates the typical Jeep profile and the special exterior details of the Jeep Wrangler Rubicon 10th Anniversary Edition. It can be built as a hardtop or a soft top version. This model’s movable suspension system has four springs. The roll cage and seats are carefully designed by digital sculpting. The seats are pre-colored. The Jeep emblem and rearview mirrors are replicated by reflective foil. It will surely stand out from your collection of civilian car model kits.